Ferry owner says Google Maps sends drivers onto one-way street. Peter Wells, owner of the Chappy Ferry, says the movie “Chappaquiddick” is already drawing tourists to the Edgartown island, and Google Maps has them going the wrong way on a one-way street to get there. At the Edgartown board of selectmen’s meeting Monday, Wells said after a year and a half of pleading with Google, it finally relented that the last 50 feet of Dock Street is one way, and its maps send drivers in the wrong direction. With the release of the movie and the 50-year anniversary of the crash involving Sen. Edward Kennedy that killed Mary Jo Kopechne coming up next year, Wells is expecting the gawkers to keep on coming. 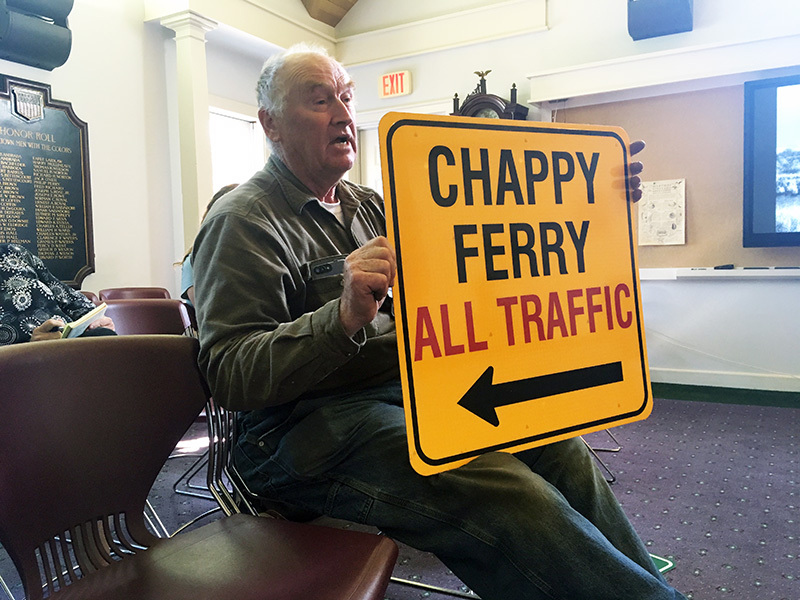 Holding an orange sign that states “Chappy Ferry All Traffic,” he asked selectmen to post a similar sign near Capt. Porky’s Bait and Tackle on Dock Street that will point all traffic in the right direction. 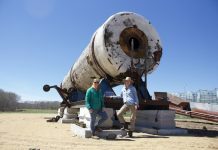 But selectman Margaret Serpa asked her colleagues to hit the pause button and get Police Chief Bruce McNamee and highway superintendent Stuart Fuller involved in deciding if and where to erect the sign. “A lot of signs can be confusing,” she said. A sign entering lower Main Street in Edgartown directs Chappy Ferry seekers away from Main Street and onto Peases Point Way, and eventually to Dagget Street. That sign has endured, Wells said, despite the Chappy Ferry signs becoming somewhat of a collector’s item. Meanwhile, the board heard a report from town counsel Ronald Rappaport saying that members of the Yellow House committee have agreed on new wording so the town can send out requests for proposals seeking new bidders on the town-owned historic house. The town purchased the house, which is adjacent to town hall, by eminent domain for $3.1 million. A bid process had to be scrapped when issues arose during negotiations with the successful bidder about how best to protect a shade tree on the property. When the RFP is reissued, bidders will be allowed to make separate bids on the Yellow House and a smaller building on the property, Rappaport said. A bidder may not just bid on the smaller building, he said. Small additions will be allowed to the smaller building, though not a second floor, Rappaport said. Parking will also be considered in the RFP process, he said. Bidders who use three or fewer spaces will be considered most advantageous, he said. The bid process will allow for a new foundation under the Yellow House, but any addition will have to be without the benefit of a basement, he said. Once the RFP is advertised, Chris Scott, chairman of the Yellow House committee, said he expects the evaluation process to take about eight weeks, geared toward a mid-October start date for the project. 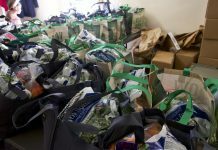 When Juliet Mulinare, the town’s procurement officer, said the evaluation process could possibly be cut by a week, selectmen chairman Michael Donaroma liked the sound of that. “The shorter, the better,” he said.